Educated by Initiative moves beyond previous evaluations of public policy to emphasize the educational importance of the initiative process itself. Since a majority of ballots ultimately fail or get overturned by the courts, Smith and Tolbert suggest that the educational consequences of initiative voting may be more important than the outcomes of the ballots themselves. The result is a fascinating and thoroughly-researched book about how direct democracy teaches citizens about politics, voting, civic engagement and the influence of special interests and political parties. Designed to be accessible to anyone interested in the future of American democracy, the book includes boxes (titled "What Matters") that succinctly summarize the authors' data into easily readable analyses. Daniel A. Smith is Associate Professor of Political Science at the University of Florida. Caroline J. Tolbert is Associate Professor of Political Science at Kent State University. "Smith and Tolbert make a remarkable contribution to the literature on direct democracy, focusing on the educative rather than the instrumental effects of the initiative and referendum. 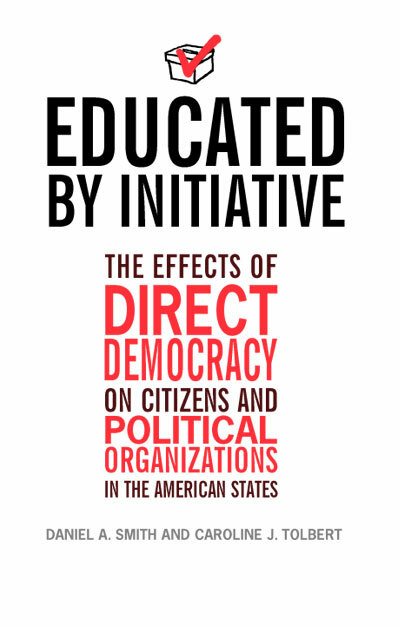 As such, this book highlights the importance of direct democracy, and provides new information as well as an alternative theoretical structure to examine its role in American political life. HIGHLY RECOMMENDED." "The citizen initiative feels good to voters, but in Educated by Initiative, Daniel Smith and Caroline Tolbert demonstrate that it's good for our democracy, too." "The purpose of any book review is to give the reader the answer to one simple question 'is the book worth reading?' In this case, the answer is a resounding yes. Daniel Smith and Caroline Tolbert have gone past the traditional methods of analyzing direct democracy and have taken a very insightful look at citizen lawmaking in the United States." "Smith and Tolbert have pursued a valuable area of research and have provided a solid foundation for further work. They have helped to specify and examine noninstrumental effects of direct democracy that may ultimately prove as important as any instrumental ones. For this we owe them a debt." 3 drawings, 15 tables, 11 charts.